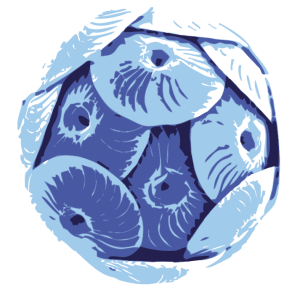 Many laboratory-based experiments have demonstrated that ocean acidification may hamper calcification in marine organisms such as corals and echinoderms. Sea urchins are considered highly vulnerable to reduced ocean pH and increased pCO2. However, it is unclear whether predictions derived from laboratory experiments will realistically reflect future changes in the field. We studied the sea urchin Echinometra sp. C on natural volcanic CO2 vents in Papua New Guinea, where they and their environment are acclimatized to elevated CO2. Near the vent site, the urchins experienced large daily variations in pH (> 1 unit) and pCO2 (> 2000 ppm) and average pH values much below those expected under the future emission scenarios. Growth was measured over a 17 month period using tetracycline tagging of the feeding lanterns. Urchins at the vents grew more than twice as fast than those at a control site and assumed larger sizes compared to three controls. No differences in mortality, respiration, or robustness of the test were detected between urchins from vent and control populations. Thus, in contrast to results derived from laboratory studies, urchins did not only ‘cope’ but actually ‘thrived’ under extreme CO2 conditions. We hypothesise an ecological basis for this response: increased algal productivity under increased pCO2 provided more food at the vent, resulting in higher growth rates. The implications of our study are that laboratory studies, with non-acclimatized specimens which do not take into consideration ecological changes, may lead to erroneous conclusions about the responses to global change.